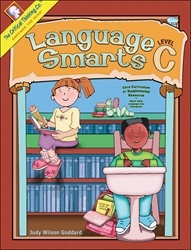 This 320 page book teaches the language arts concepts and skills students are expected to know in second grade. It also introduces several skills and concepts normally taught in third grade. This fun, mind building book teaches standards-based language arts and develops critical thinking skills. 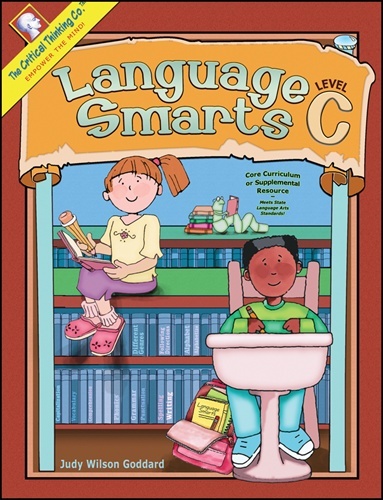 Language Smarts™ can serve as a core curriculum for language arts or as a supplemental resource. Empower your child’s mind as you improve their vocabulary, grammar, punctuation, reading, and writing skills. Teaching and practicing language arts skills and concepts has never been easier! No lesson preparation needed! Each section introduces a specific topic, followed by appropriate practice and application activities. These engaging and colorful lessons develop critical thinking and language arts skills through a variety of activities and different genres: Common Phrases, Palindromes, Pangrams, Mnemonics, Nursery Rhymes, Poems, Folk Tales (Fairy Tales and Fables), Fiction, Non-fiction, Reality, Fantasy, Rhyme, Riddle, and Word Play. Visual Skills: sequencing; compare/contrast; interpret and apply pictures, captions, diagrams, charts, and graphs; literal thinking; number-word sentences and expressions. Phonological and Phonemic Awareness: blend sounds to make words; identify, segment, and combine syllables in words; recognize and produce rhyming words; identify initial, final, and medial letter sounds; classify vowel/consonant, rhyming and non-rhyming words; recognize and categorize word families. Comprehension: predict; sequence/summarize; draw conclusions, make predictions, and identify facts and inferences; compare/contrast; follow logical reasoning; synthesize illustration/text information, and cause/effect; identify and analyze characters/conflict; context clues; ordering; problem/resolution; recall details; restate; identify and describe setting; summarize important ideas/events and supporting details; identify theme/topic, purpose, and main idea. Fluency and Flexibility with word meanings and associations to improve spelling, vocabulary, and reading through evaluating antonyms, synonyms, homonyms, homophones, prefixes, suffixes, and root words. Word Relationships: classify word groups; form pairs of related items; identify and classify types of analogous relationships; select and supply words and word pairs to complete relationships. Grammar, punctuation, spelling, and capitalization skills: through single-skill practice with guided, gradual instruction and practice, and mixed-skills practice.